Planning on visiting Beijing? Whether you are spending one week in Beijing or just making a stop during your Asian trip, Beijing is sure to leave a lasting impression on you. Use this page to help get inspiration and be prepared for your upcoming trip. Walk along the Great Wall: a must-do activity in Beijing. The Great Wall section at Mutianyu is recommended because it’s less crowded and has convenient facilities. Read this comparison between different sections of the Great Wall. 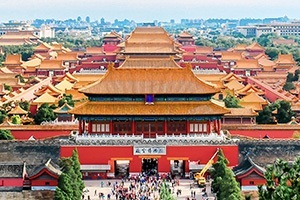 Explore the Forbidden City: the second most popular attraction in Beijing. It is hard to get an idea of the great size of the imperial palace until you are in it. Savor the Summer Palace — while one palace was forbidden, this one remains inviting. Wander where the royals relaxed in the warmer months. Discover the enchanting hutongs. Sightsee, shop, and dine in ancient residential and shopping streets. If you are interested, we can help you enjoy a home-visit to a traditional hutong courtyard house. 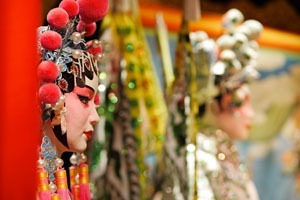 Experience other things, such as Beijing roast duck, a kung fu show, or an acrobatic show. Day 1: Discover the Forbidden City and the hutongs. 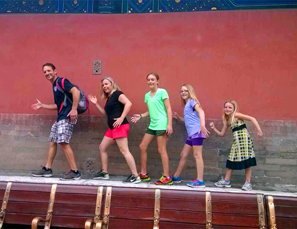 Day 2: Hike the Great Wall at Mutianyu and visit the Temple of Heaven. Day 3: Visit the Summer Palace. Click to see our handcrafted itinerary with detailed descriptions and vivid pictures as a starting point for your tailor-made tour. If you want to discover more of Beijing, you will need one or two days more. Our travel experts are happy to tailor-make a Beijing tour according to your special interests and requirements, or see our Best Beijing Side trips, Top 5 China Tours from Beijing, Best Hutong Tours and Beijing tours for some inspiration. Usually, foreigners need to apply for a visa before traveling to China. If you meet the relevant qualifying criteria of the 144-hour visa-free transit policy, you can stay in Beijing for 144 hours without a visa. The best time to visit is from September to November, as the weather is usually quite temperate, and there are relatively few tourists. 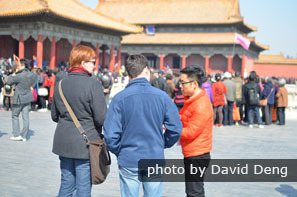 Our private tours of the Forbidden City will help you avoid the crowds. The high season is from April to October. Pros: warm weather and long days; cons: crowds, heat, and high costs. The low season is from November to March. Pros: less crowd and lower prices; cons: cold weather and short days. Take our private tour to enjoy a more comfortable trip. Your guide will help you skip the lines at the famous Forbidden City, lead you to explore a less crowded part of the Great Wall, and keep you refreshed with ice water and air-conditioned private transport. Read more about Beijing’s weather. Beijing is a huge city with a vast range of accommodation options suiting every budget, including hotels, hostels, traditional hutong courtyards, guesthouses, and boutiques. There are several areas you can consider when choosing your hotel: central Beijing (Wangfujing), northeast Beijing (Chaoyang District), and the Houhai area. 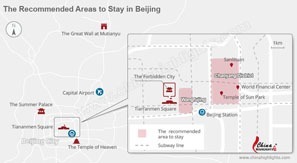 Learn more about 11 best areas to stay in Beijing. Click to enlarge it! 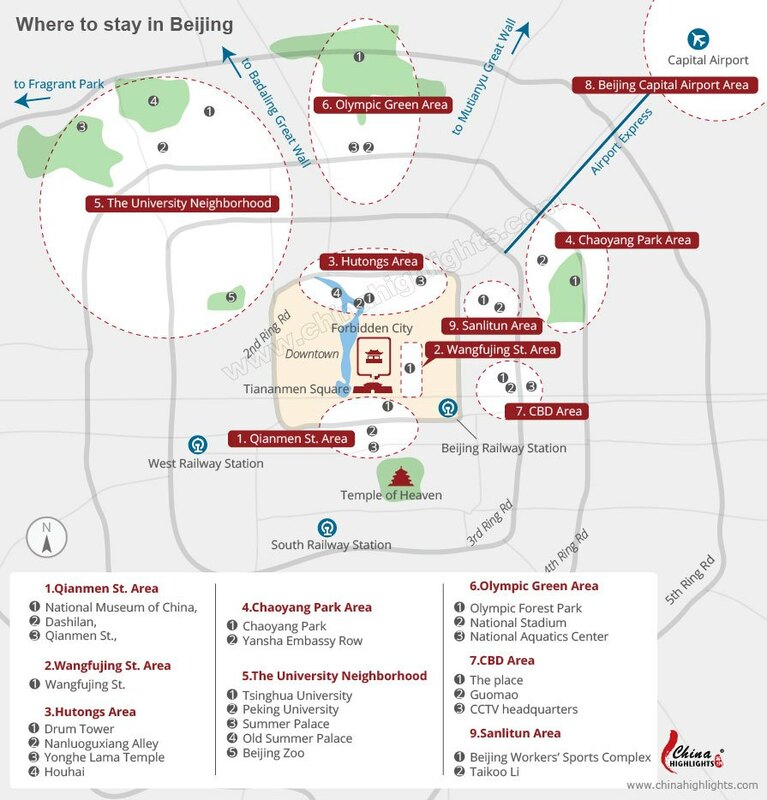 A map shows you the recommended areas to stay in Beijing. 1. A number of hotels, from budget-friendly options to high-end luxurious suites. 2. Located in central Beijing, it is in walking distance to Tian’anmen Square and the Forbidden City. 3. It’s a massive shopping street with a lot to offer. 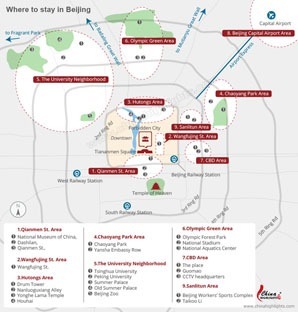 11 Best Areas to Stay in Beijing, click to enlarge. 1. It is a new business district, surrounded by touring conveniences. 2. It is home to hundreds of skyscrapers and newly-built mid/high-end hotels. Beijing has food from all over China as well as from many parts of the world. There are thousands of restaurants, including Chinese restaurants, Western restaurants, vegetarian restaurants, Muslim restaurants, and Asian restaurants. 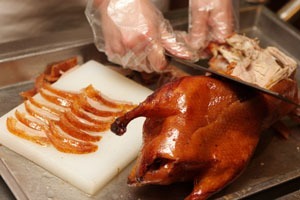 There are quite a few dishes which are unique to Beijing, and one of the most famous specialties is roast duck. The famous roast duck chains of restaurants are Quanjude (全聚德) and Dadong (大董). Your local guide can give you recommendations according to your tastes and requirements. He/she can help you to order dishes, giving you a hassle-free dining experience. 1. Read some movies or books about China and Beijing. See 10 Movies to Watch Before Going to China. 2. Get your mobile phone plans in order. Make sure your SIM card is compatible on a Chinese network if you plan to use it. Read some information about Internet access in China. 3. Learn a few words of Chinese, such as “please”, “hello”, “thank you”, and “excuse me”. 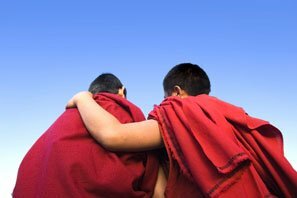 Strangers are more likely to show kindness when you make an attempt to speak in their local language. 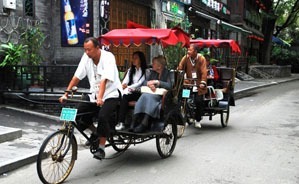 Ride to the old hutong area with your guide and take a rickshaw through the 300-year-old hutongs. If the above information is not enough for you to plan your Beijing tour, feel free to contact us. Our specialists will help you to maximize your travel experience by suggesting the optimal trip for the time you have available and the things you love to do. Here are some sample Beijing itineraries for inspiration. They’re able to be tailor-made down to the finest detail according to your tastes and interests. 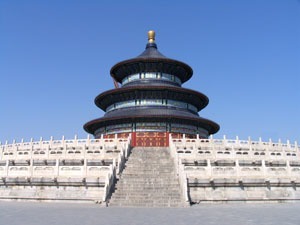 1-Day Beijing Highlights Private Tour: This is specially designed for people who are restricted on time. 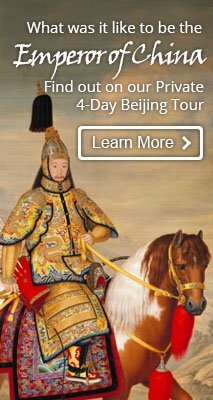 Visit our Beijing tours pages to see more private tour options.